Another writer relates this more particularly. Sir Edward, while he was in France, had private instructions from England to mediate a peace for the protestants in France; and, in case of a refusal, to use certain menaces. Accordingly, being referred to de Luines, he delivered to him the message, reserving his threatenings till he saw how the matter was relished. 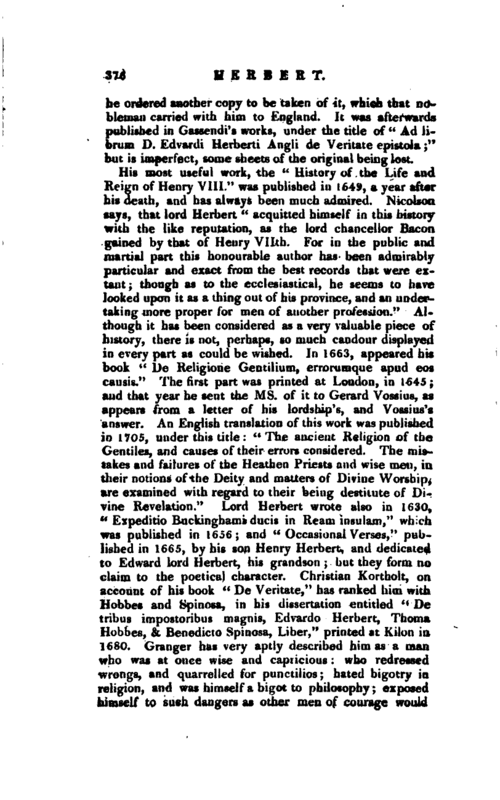 De Luines had concealed a gentleman of the reformed religion behind the curtain; who, heing an ear-witness of what passed, might relate to his friends what little expectations they ought to entertain of the king of England’s intercession. De Luines was very haughty, and asked what our king had to do in this affair. Sir Edward replied, “It is not to you, to whom the king my master owcth an account of his actions; and for me it is enough that I obey him. In the mean time I must maintain, that my master hath more reason to do what he doth, than you to ask why he doth it. Nevertheless, if you desire me in a gentle fashion, I shall acquaint you farther.” Upon this, de Luines bowing a little, said, “Very well.” The ambassador then gave him some reasons; to which de Luines said, “We will have none of your advices.” The ambassador replied, “that he took that for an answer, and was sorry only, that the affection and good-will of the king his master was not sufficiently understood and that, since it was rejected ii> that manner, he could do no less than say, that the king his master knew well enough what to do.” De Luines answered, “We are not afraid of you.” The ambassador smiling a little, replied, “If you had said you had not loved us, I should | have believed you, and given you another answer. In the mean time, all that I will tell you more is, that we know very well what we have to do.” De Luines upon this, rising from his chair with a fashion and countenance a little discomposed, said, “By G, if you were not monsieur the ambassador, I know very well how I would use yon.” Sir Edward Herbert rising also from his chair, said, that “as he was the king of Great Britain’s ambassador, so he was also a gentleman; and that his sword, whereon he laid his hand, should give him satisfaction if he had taken any offence.” After which, de Luines making no reply, the ambassador went on towards the door, and de Luines seeming to accompany him, sir Edward told him, that “there was no occasion to use such ceremony after such language,” and so departed, expecting to hear farther from him. But no message being brought from de Luines, he had, in pursuance of his instructions, a more civil audience from the king at Coignac; where the marshal of St. Geran told him that tf he had offended the constable, and was not in a place of security there:“to which he answered, that” he thought himself to be in a place of security wheresoever he had his sword by him." 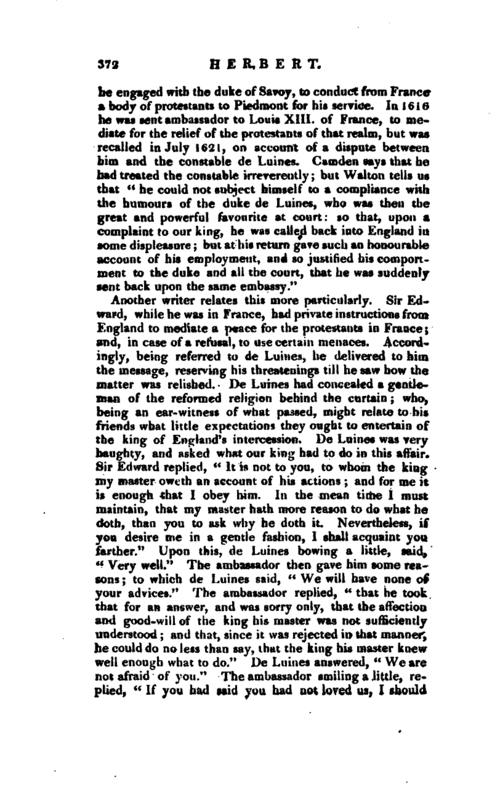 De Luines, resenting the affront, procured Cadinet his brother, duke of Chaun, with a train of officers, of whom there was not one, as he told king James, but had killed his man, to go as an ambassador extraordinary; who misrepresented the affair so much to the disadvantage of sir Edward, that the earl of Carlisle, who was sent to accommodate the misunderstanding which might arise between the two crowns, got him recalled; until the gentleman who stood behind the curtain, out of a regard to truth and honour, related all the circumstances so as to make it appear, that though de Luines gave the first affront, yet sir Edward had kept himself within the bounds of his instructions and honour. 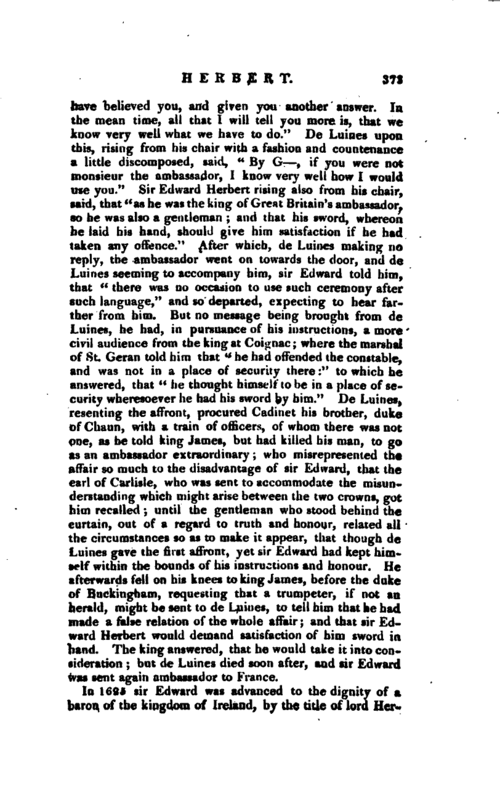 He afterwards fell on his knees to king James, before the duke of Buckingham, requesting that a trumpeter, if not an herald, might be sent to de Luines, to tell him that he had made a false relation of the whole affair; and that sir Edward Herbert would demand satisfaction of him sword in hand. The king answered, that he would take it into consideration; but de Luines died soon after, and sir Edward was sent again ambassador to France. In 1625 sir Edward was advanced to the dignity of a baron of the kingdom of Ireland, by the title of lord | Herbert of Castle-Island; and, in 1631, to that of lord Herbert of Cherbury in Shropshire. After the breaking out of the civil wars, he adhered to the parliament; and, Feb. 25, 1644, “had an allowance granted him for his livelihood, having been spoiled by the king’s forces,” as Whitelocke says; or, as “Wood relates it,” received satisfaction from the members of that house, for their causing Montgomery castle to be demolished.“In the parliamentary history, it is said that lord Herbert offended the House of lords by a speech in favour of the king, and that he attended his majesty at York. 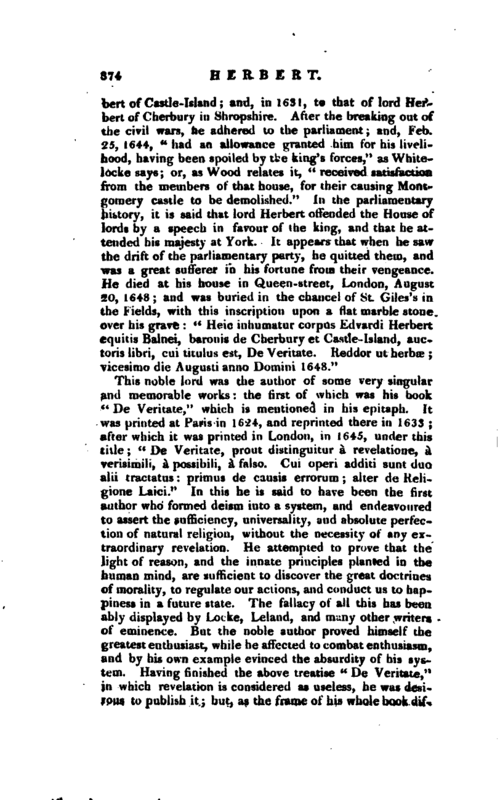 It appears that when he saw the drift of the parliamentary party, he quitted them, and was a great sufferer in his fortune from their vengeance. He died at his house in Queen-street, London, August 20, 1648; and was buried in the chancel of St. Giles’s in the Fields, with this inscription upon a flat marble stone over his grave:” Heic inhumatqr corpus Edvardi Herbert equitis Balnei, baronis de Cherbury et Castle-Island, auctoris libri, cui titulus est, De Veritate. Keddor ut herbae; vicesimo die Augusti anno Domini 1648." 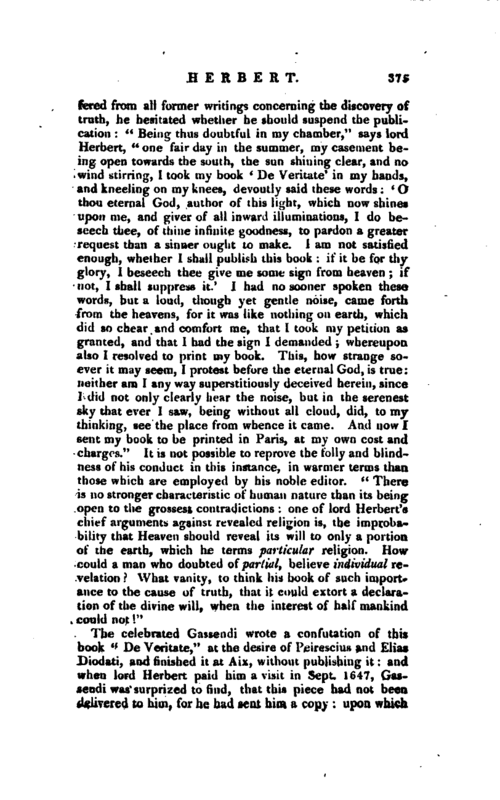 The celebrated Gassendi wrote a confutation of this book “De Veritate,” at the desire of Peirescius and Elias Diodati and finished it at Aix, without publishing it: and when lord Herbert paid him a visit in Sept. 1647, Gassendi was surprized to find, that this piece had not been delivered to him, for he had sent him a copy: upon which | he ordered another copy to be taken of it, which that nobleman carried with him to England. It was afterwards published in Gassendi’s works, under the title of “Ad librum D. Edvardi Herberti Angli de Veritate epistola;” but is imperfect, some sheets of the original being lost. Life by himself. 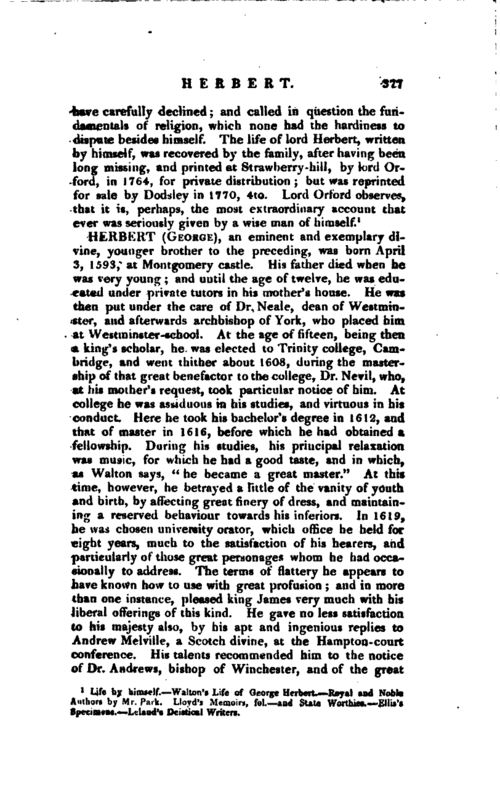 Walton’s Life of George Herbert Royal and Noble Authors by Mr. Park. 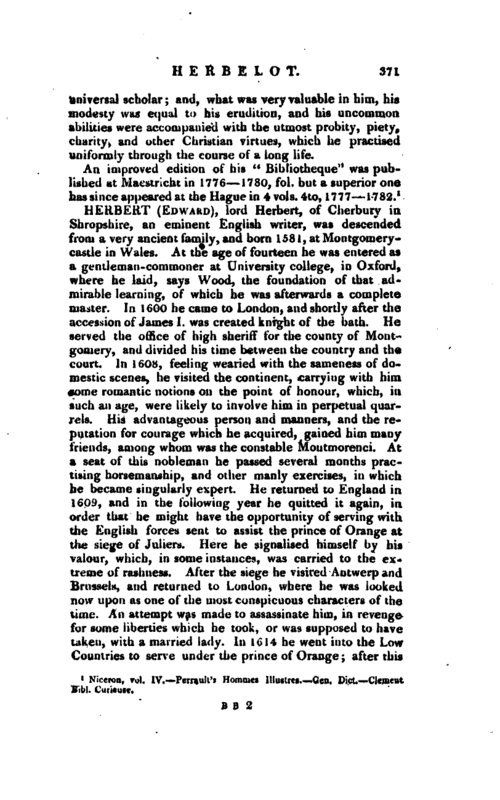 Lloyd’s Memoirs, fol.-aud State Worthies. Ellis’s Specimens. —Leland’s Deistical Writers.